This book is no less than a guide to the whole of Western philosophy—the ideas that have undergirded our civilization for two-and-a-half thousand years. Anthony Kenny tells the story of philosophy from ancient Greece through the Middle Ages and the Enlightenment into the modern world. He introduces us to the great thinkers and their ideas, starting with Plato, Aristotle, and the other founders of Western thought. In the second part of the book he takes us through athousand years of medieval philosophy, and shows us the rich intellectual legacy of Christian thinkers like Augustine, Aquinas, and Ockham. Moving into the early modern period, we explore the great works of Descartes, Hobbes, Locke, Leibniz, Spinoza, Hume, and Kant, which remain essential readingtoday. In the nineteenth and twentieth centuries, Hegel, Mill, Nietzsche, Freud, and Wittgenstein again transformed the way we see the world.Running though the book are certain themes which have been constant concerns of philosophy since its early beginnings: the fundamental questions of what exists and how we can know about it; the nature of humanity, the mind, truth, and meaning; the place of God in the universe; how we should live and how society should be ordered. 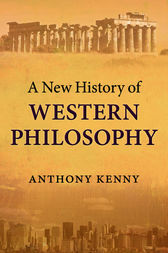 Anthony Kenny traces the development of these themes through the centuries: we see how the questions asked and answers offered by the great philosophers of the pastremain vividly alive today.Anyone interested in ideas and their history will find this a fascinating and stimulating read.